I’ve run out of superlatives…. Yesterday we moved the coach around on our site, and we now look out over the lake. The Taxi also serves as a useful sound barrier for the site next door, where we have neighbors for the weekend. We spent the day mostly on-site, because the fire was going and going and we cooked over it, the sun was so wonderful, it was nice to all sit in our rocking chairs, the temp hit 69, people kept dropping by, we helped the boys explore the thick carpet of pine needles around the edge of our site, and we kept getting food from the coach. Our lives are so simple that nearly everything revolves around the weather and our parking spot. We had the best of everything today. 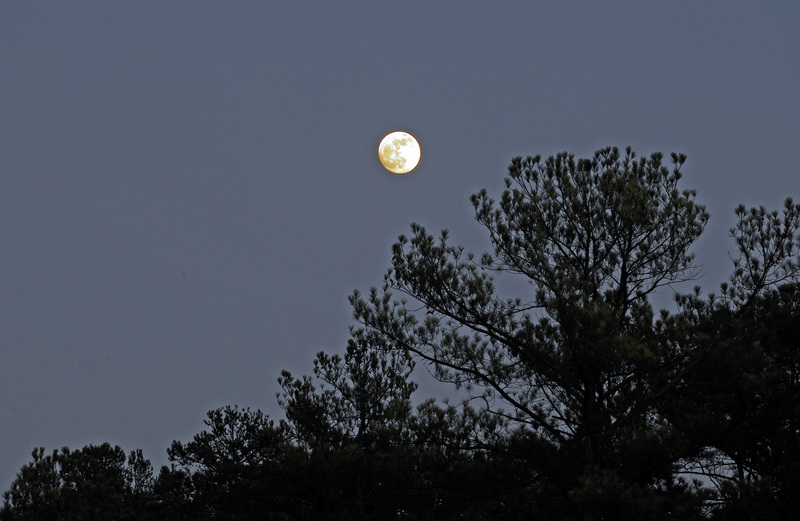 And just before sundown, the moon began to rise in front of us. That’s a beautiful shot of the moon. Thanks….it looked like we could just reach out and touch it! Same moon but definitely not sitting-outdoor weather here in Ohio! Enjoying your posts.